Hi guys! 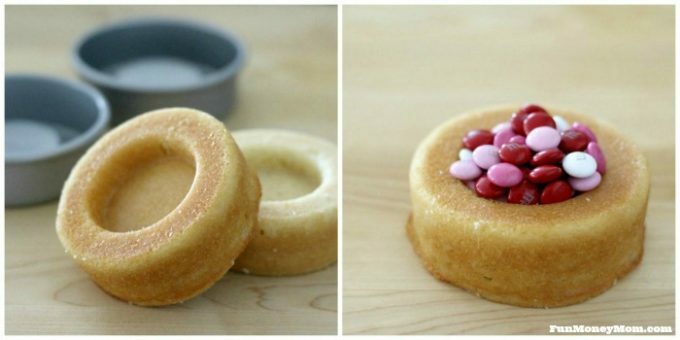 I’m Lisa from Fun Money Mom and I’m popping in to share one of my new favorite Valentine’s Day recipes, our Mini Valentine Cake with a Candy Surprise. One of the things I love most about Valentine’s Day is all the sweet treats that go along with it and I have to admit, I’ve gone a little overboard this year. I’ve made everything from layered Valentine’s Day bark (seriously delicious!) to edible Rice Krispie cups filled with candy. I’m always picking up random things in the grocery store because I never know what I’m going to make next. As soon as the Valentine’s Day M&M’s hit the shelves, I grabbed them. However, by the time I was ready to make my recipe, I realized my husband had already raided the bag. One more trip to the store and I was good to go! 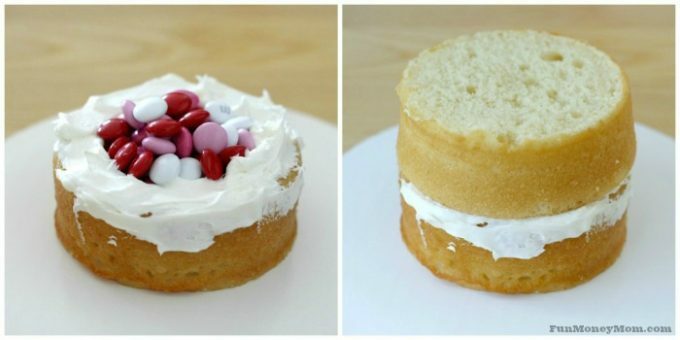 The plan was to make a fun mini Valentine cake with an M&M surprise in the middle. I love using my mini cake pans because one cake is plenty for four people (or two people who want giant pieces). I’m a big fan of easy recipes so I just used boxed mix because the fun in this treat is the decorating. One box makes eight mini-cakes so I used two and froze the rest for later. Once the cakes have finished baking, be sure level them so that they’re flat on the bottom. 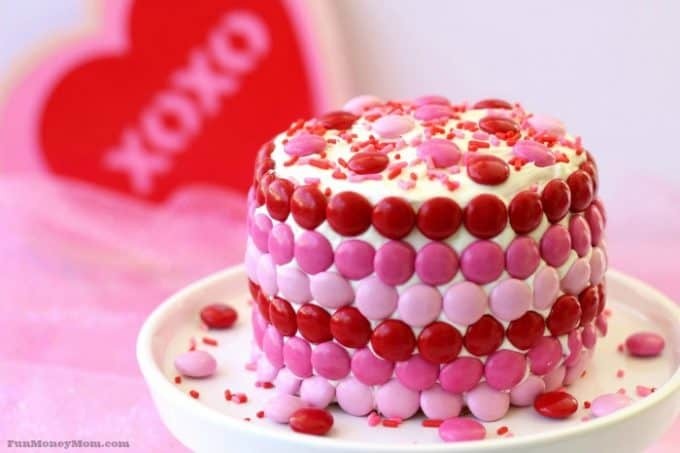 Then fill one of the cakes with as much candy as you possibly can. There’s no such thing as too many M&M’s, right? 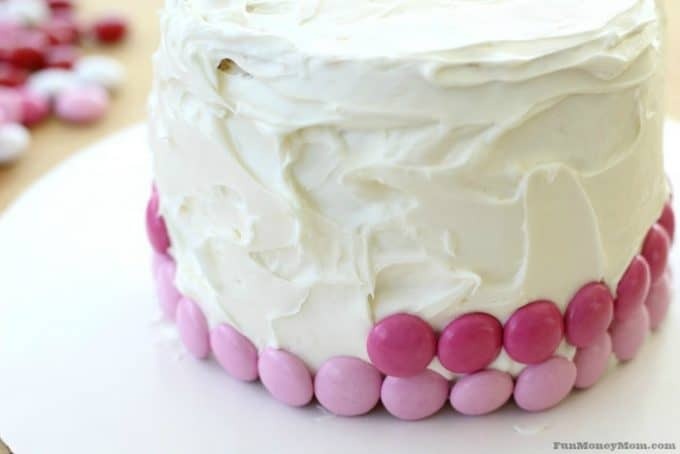 Frost the cake around the M&M’s and place the second cake on top. Next, frost the rest of the cake and add more M&M’s. Don’t worry about making it perfectly smooth because it’ll be covered with candy anyway. Finally, add a few more M&M’s and some pretty sprinkles on top. 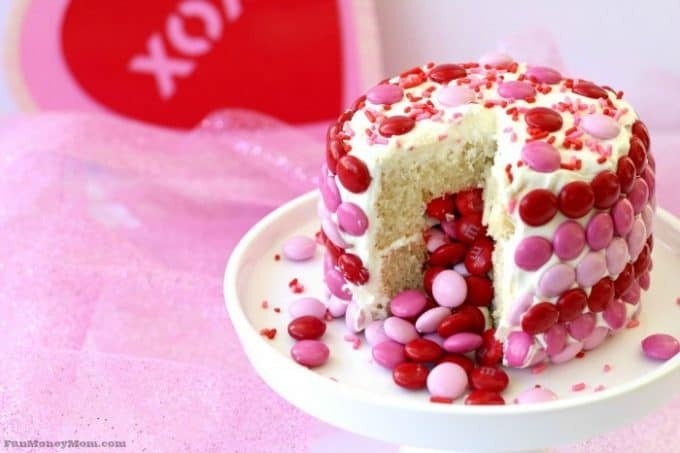 Voila, your Valentine cake is ready to eat! Since my girls weren’t home when I made this, it was fun to see their excitement when they discovered the fun candy surprise in the middle. Ever since I made Rainbow Surprise cupcakes last year, they go crazy for treats like this! One of these cakes was enough for all four of us, though I have to admit, there were no leftovers! 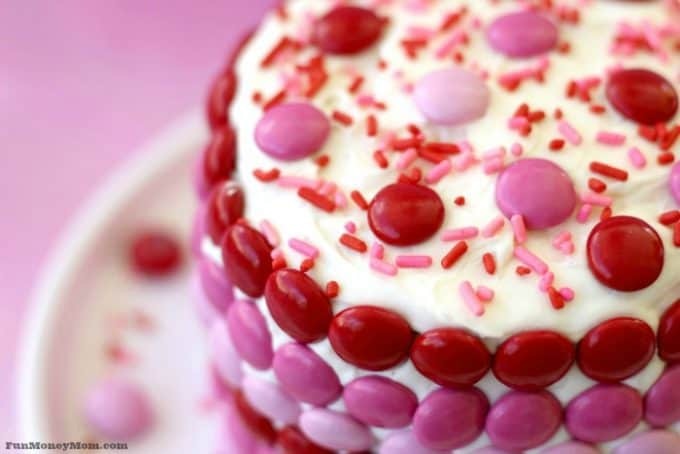 Until now, these pretty candy hearts were my absolute favorite Valentine’s day treat but after making this mini Valentine cake, I’m not so sure anymore! For Valentine box inspiration, check out the cute Shopkins Valentine’s Day box that my daughter and I made together. These are so cute! I love the tiny little cake pans, I need some of them!